Blog » 13 Family Friendly Things To Do On Leeds Light Night! 1. LAUNCH EVENT ‘The Art of Protest’ Illuminated Parade – Various Artists. Join The Lantern Company and Dundu with special guests Stealing Sheep and Drum Machine for this illuminated celebration marking 100 years of women’s suffrage. From renowned Leeds suffragettes Leonora Cohen and Mary Gawthorpe of a century ago, to Tamara Burke, founder of present-day movement #MeToo, we will be celebrating inspiring women from the past 100 years of social change campaigns and protests. Visit the Light Night Leeds website for the route and more details on how to get involved. Thursday 7:30 pm – 8:30 pm. THE HEADROW ZONE. 2. wallFour’s Laser Games. 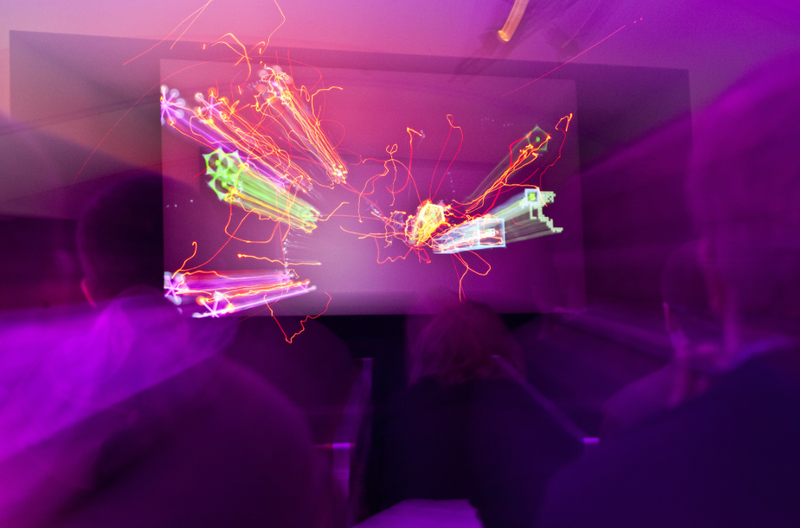 wallFour, creators of multi-award winning renga, the feature-length 500 player collaborative laser game, will be bringing a collection of their laser controlled game experiences developed for smaller groups including ‘Laser Jigsaw’ and [renku] to Leeds Night Light. wallFour’s groundbreaking technology turns giant screens into huge multi-player spaces. 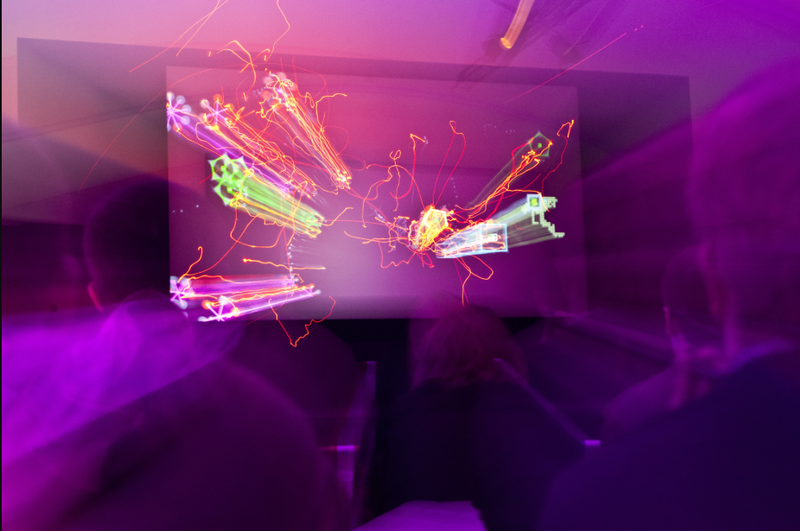 Players use laser pointers to control the action on a huge projection screen. You’ll only succeed if you can work together with the rest of the attendees. Come prepared to shout and scream at your new teammates. Arrive as an audience, leave as a team. Suitable for Children 8+ if supported by parents. Younger children welcome to shout and support. Thursday & Friday, 6 pm – 10 pm (Running every 30 minutes, each play session runs for 20 minutes). MILLENIUM SQUARE ZONE. 3. The Norms: Process & Production (A Glow in the Dark Exhibition) – Doctor Simpo (UK). On Light Night the lights will go off and the spooks will come out at Leeds Arts University. Get your spook spotters kit at the ready to hunt for an ‘unlucky for some’ 13 spooks at Vernon Street, featuring some of the most iconic cartoon and comic characters of all time. Solve the mystery to win your official spook spotters badge. You will also get the chance to enter the inside of Doctor Simpo’s noggin and see giant glowing cartoon worlds and other real-life interpretations of pages taken from his new book and kids TV pilot ‘The Norms’. Thursday & Friday, 6 pm – 9 pm. MILLENIUM SQUARE ZONE. 4. Pirates, Pants and Wellyphants – Nick Sharratt (UK). Pirates, Pants and Wellyphants is a wonderfully bright and colourful touring exhibition all about favourite children’s author and illustrator Nick Sharratt. There’s loads to look at, from drawings he did as a boy and a student to his original picture book artwork. There are sections on how picture books are made, and lots of activities to do, including dressing up, creating your own ‘Sharracter’ and working in Nick’s studio. Exhibition running until 24th November. Friday, 6 pm – 9.30 pm. TOWN HALL ZONE. 5. Useless Art – Artspace. A special family activity messing about with materials alongside Leeds Art Gallery staff and Leeds art students to celebrate the suggestion that visual art is “useless, edgeless and homeless…and that is a good thing”. Thursday & Friday, 5.00 pm – 8.00 pm. TOWN HALL ZONE. 6. Light Night Big Top – Leeds Children’s Circus (UK). Roll Up Roll Up….Celebrating 250 years of the modern circus, Leeds Children’s Circus will be turning the event space at Kirkgate Market into a fun-filled Big Top for Light Night Leeds. 7. Moon Beam – Cirque Bijou (UK). Celebrate the 250th anniversary of the modern circus by witnessing world-class aerial artists at Light Night. Cirque Bijou return to Trinity Leeds to present a thrilling high line performance set against the backdrop of the stunning illuminated ceiling. Audiences will be in awe of their space acrobat as he attempts a daredevil moonwalk through the Trinity stars, high above their heads. Cirque Bijou create cutting-edge live performance that pushes the boundaries of contemporary circus, street theatre and spectacle. 8. VR Playground – Thrill Laboratory (UK). Don a virtual reality headset, jump on a playground swing and be transported on an exhilarating swing-powered adventure. Choose to scoot through the metropolis inside a mono-wheel, leap tall structures in a single bound, undulate like a jellyfish in the deep abyss, or strut your stuff like a giant robot. Created by the world’s only Thrill Engineer, Professor Brendan Walker, and produced with support from Horizon, Norfolk & Norwich Festival, and Arts Council England. Suitable for ages 11+. 9. Heofon Light Maze. Another chance to lose yourself in ‘Heofon’, an immersive light installation designed by Ben Busche, Brut Deluxe, and manufactured by Ilmex S.A in collaboration with ARRO Lighting. A maze based on triangular geometry and built with 2.5m high panels of acrylic glass, the panels reflect or shift light rays along the entire colour range of a rainbow while the spectator moves in the installation. On the outer perimeter, the panels are covered with a mirror film converting the interior in an infinity room – a unique cosmos of overlapping light patterns and constantly changing colours. Presented in association with Leeds BID. Thursday & Friday, 6.00 pm – 11.00 pm. STATION ZONE. 10. Dr Kronovator’s Fire Laboratory – Emergency Exit Arts (UK). On Light Night Queen Square will become an awe-inspiring fire laboratory. Dr. Kronovator and his team will be busy preparing their experimental flame and steam-powered contraptions that audiences will be invited to activate. Wander through a vista of flames and chemical reactions made all the more exciting and intriguing through an evocative and informative soundscape. Dr. Kronovator’s Fire Laboratory is a stunning interactive environment with ingenious fire installations for audiences of all ages. Thursday & Friday, 7.30pm – 10.30pm. ARENA ZONE. 11. Shadow Theatre – Simon Warner (UK). Create and save your own silhouette scenes and portraits with photographer Simon Warner. Cut out your own shapes, or use our props to pose, laugh, or tell your own story on the screen. 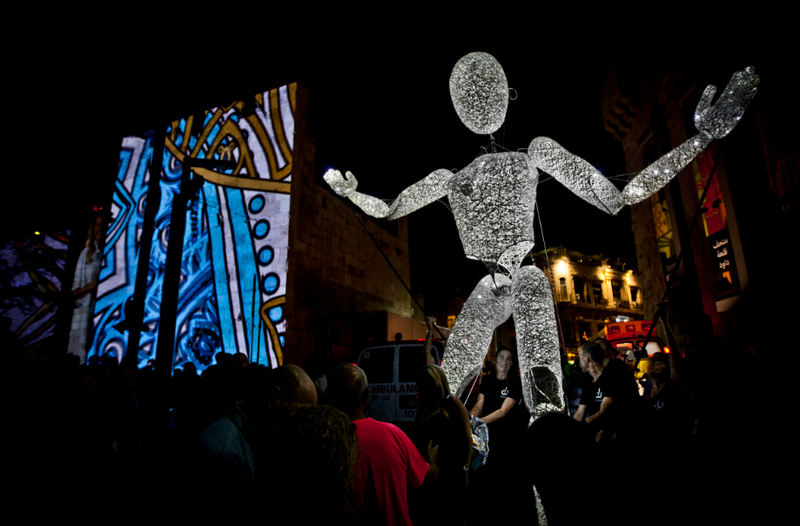 We will take photos of your creations to upload for a memento of Light Night. Thursday and Friday, 6.00 pm – 11.00 pm. SOUTHBANK ZONE. 12. More Than A Mushroom – Grow Wild and Create 180 (UK). Join Grow Wild, the national outreach initiative of Kew Gardens, on a Fungi Quest to discover the hidden depths of the fungi kingdom. Let our giant fungus help you communicate with others around you, and join the most extensive network ever imagined – the Wood Wide Web! Thursday 5:00 pm – 8:00 pm and Friday 5:00 pm – 10.30 pm. UNIVERSITY ZONE. 13. Fierce Flow – Symoné. A unique series of routines that combine multiple hoops with fierce roller-skate moves. Symoné is an international circus artist who has taken over stages around the world, known for cleverly combining skill sets in feel good routines, she’ll have you shaking your hips along with her.